2002 has been a benchmark year for Praise & Worship music. You can hear it on the radio and see it in the sales charts, but most of all you can see it in the lives of those who have renewed their desire to draw closer to God through worship. Here at Songs4Worship.com, we've combed through 2002's worship releases and landed on the following as our year-end picks. It was no easy task, given the plethora of albums that released this year, but we ruled out the compilations, to narrow the field. We hope you've already got these in your collection, but if not, take another look at the year's best. Okay, so there's such a thing as overkill, and we've certainly heard enough about this album to be tired of hearing it by now. Still, as the best selling worship album of the year, Worship Again isn't just a sales phenomenon. It is, as BarnesandNoble.com so aptly put it, "a monumental achievement from an enduring talent." Worship Again bested its predecessor, Worship, with an even stronger mix of the new with the classic, and kept worship at the center of Christian music...again. Read the full Songs4Worship.com review of this album. With pink hair and screaming guitars, Rock & Roll Worship Circus is anything but typical worship fare, but listeners and critics agree that this modern rock band deserves high marks for sound innovation and pure, undeniable passion. 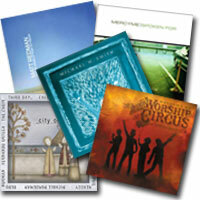 Christian Musician Magazine called the Circus' debut worship release, "Perhaps the most unique worship project ever released..." and we certainly agree. Welcome to the Rock & Roll Worship Circus is the once-in-a-blue moon kind of modern worship album that leaves an indelible mark. We're blessed to live in an age where God is working mightily in the hearts of young men and women, calling them and gifting them to do great things for His kingdom. British-born Matt Redman is just one that God is using to cultivate passion among Christian youth, even lighting a flame in the hearts of those yet to believe. Where Angels Fear to Tread, Redman's solo return after a 2-year sabbatical, displays a reverence for the wonder and majesty of God that is rare, as well as an intimate, guitar-driven pop sound. He is and will continue to be a voice that stands out among the vast chorus. This album demonstrates why. The group that dominated radio charts in 2001 with the mega-hit "I Can Only Imagine," nabbing the Dove Award for Song of the Year, is back in full force with its sophomore release, Spoken For. Produced by Pete Kipley (who also directed last year's Almost There), Spoken For picks up several steps beyond where that project left off, showcasing a cohesive blend of guitar-driven roots rock and powerful ballads. This new batch of songs displays both a musical and spiritual growth, and lead singer Bart Millard shines as he sings each song with a passionate intensity and emotion. While these melodies are musically accessible, the lyrics are refreshingly deep, a combination that may broaden your definition of "worship" music. It's a rare and wonderful sophomore surprise. The second installment one of the most notable original worship music series to date, City on a Hill: Sing Alleluia features some of Christian music's brightest and best. But beyond that, as with its predecessor, City on a Hill, Sing Alleluia stands out for its lyrical originality, its seamless production and musical symmetry and its artistic beauty. It's a thoughtful, original work of passion that fosters a worshipful spirit with powerfully simple songs that focus on the all-encompassing love of God for a fallen humanity. Agree with our choices? Disagree? We'd like to hear your picks for the year. Go to the Songs4Worship.com discussion boards and post your 2002 Year-End Favorites.